and in all Judea and Samaria and to the end of the earth." And when he had said this, as they were looking on, he was lifted up, and a cloud took him out of their sight. and said, "Men of Galilee, why do you stand looking into heaven? This Jesus, who was taken up from you into heaven, will come in the same way as you saw him go into heaven." 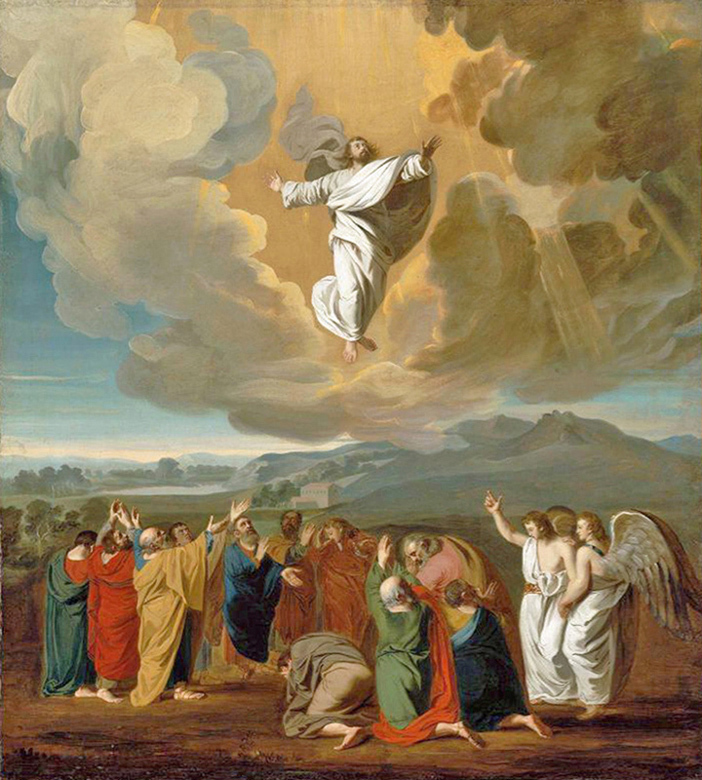 The Ascension of Our Lord Jesus Christ is described in the above passage from the Acts of the Apostles, and is also noted in Mark 16:19 and Luke 24:50-53. Jesus refers to his Ascension in the Gospel of John when he tells Mary Magdalene, "Stop holding on to me, for I have not yet ascended to the Father, but go to my brothers and say to them, I am ascending to my Father and your Father, to my God and your God" (John 20:17). Before his Ascension, Christ spent forty days teaching the Apostles and disciples about the Kingdom of God (Acts 1:3). The Lord informed them that they would receive power from the Holy Spirit to be his witnesses to the ends of the earth (Acts 1:8). The Ascension occurred at Bethany on the Mount of Olives (Luke 19:29). Christ's work of redemption has become known as the Paschal Mystery of Christ and was accomplished principally by his Passion, death, Resurrection, and Glorious Ascension into Heaven. The Paschal Mystery of Christ constitutes one action for the salvation of mankind, for Jesus “was handed over to death for our trespasses and was raised for our justification” (Romans 4:25). Jesus Christ made multiple appearances in several locations to his disciples for forty days following his Resurrection. For example, Jesus appeared first to Mary Magdalene in Jerusalem (Matthew 28:9-10, Mark 16:9, John 20:14-17), to two disciples on the Road to Emmaus (Luke 24:13-32), to Simon Peter (Luke 24:34, First Corinthians 15:5), to his disciples in the evening of that first day (John 20:19), and a week later to Thomas and the disciples (John 20:26). He appeared to James (First Corinthians 15:7), and to Peter and the Apostles in Galilee (Matthew 28:16, John 21:1). 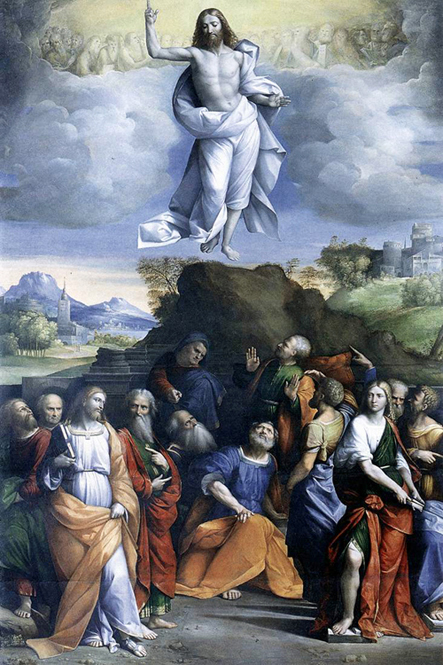 At the same time, Christ Jesus appeared to his disciples even after his Ascension into Heaven. Stephen saw Jesus "standing at the right hand of God" prior to his martyrdom (Acts 7:55). Saul experienced Conversion on the road to Damascus when he was blinded by a bright light and told "I am Jesus whom you are persecuting" (Acts 9:3-5). The Lord Jesus appeared to Ananias in Damascus, instructing him to baptize Saul of Tarsus (Acts 9:10-19). The "Spirit of Jesus" redirected Paul, Silas, Timothy, and Luke on the second missionary journey towards Troas, where they boarded a ship for Macedonia, the first recorded introduction of Christianity into Europe (Acts 16:7-10). The Lord reassured Paul to stay in Corinth after he had baptized Crispus, the ruler of the synagogue (Acts 18:9). Jesus actually appeared to Paul in the Temple of Jerusalem (Acts 22:17-18)! The Lord stood by Paul in Jerusalem and advised him that he was to "bear witness" to Him in Rome (Acts 23:11). His final appearance in Scripture was to John on the island of Patmos in the Book of Revelation (1:10-1:20). His glorious Ascension signified the completion of his time on earth, which is celebrated by the Church forty days after the Resurrection and ten days before the Pentecost, the coming of the Holy Spirit. Our Lord Jesus Christ gave us hope by promising that "when I go and prepare a place for you, I will come again and will take you to myself, that where I am you may be also" (John 14:3).